Antegra Silver is quietly bedazzling customers with their unique collection of semi-precious and enamel jewellery pieces. They even do bespoke designs for the fussy wearer! Around three years old now, this jewellery store creates statement pieces that can turn heads at any occasion. The brand’s philosophy is to be different and that reflects in their designs as well. The jewellery on display is all gold-plated silver pieces, inlaid with semi-precious stones, metal and enamel. Perfect for those of you looking to add to your modern ethnic aesthetic. Antegra sells chokers, chains, earrings and a limited number of bracelets and rings. We even hear that most pieces are designed and crafted by the same artisans at Alice Jewellery. If nothing catches your eye at the store, fear not. They do bespoke pieces too. Naturally, for a bit of an extra cost. Their most popular designs are the modern, chunky mosaic studs in an array of colours, pearl necklaces with work on the beads and pieces with uncut stones. Bit of a traditionalist? 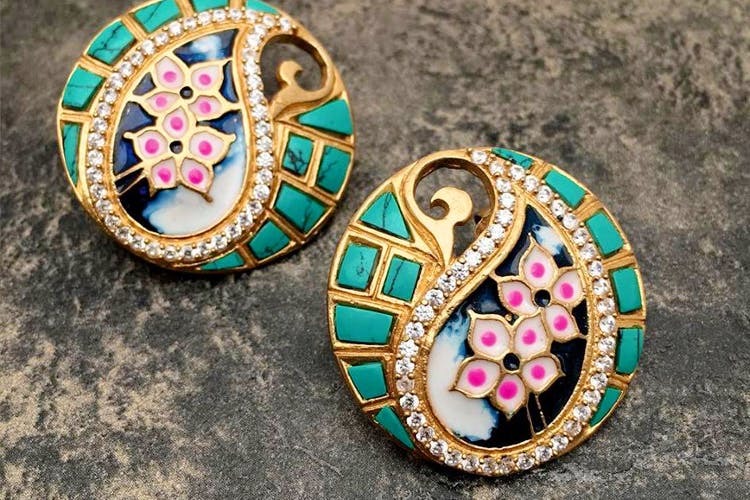 You’ll definitely find jhumkas, hoops and chandelier earrings in kundan, Afghani designs and Meenakari work as well. For those of you who love all things Bollywood, there's plenty to buy! Think pieces inspired by designs that adorned some of our stars as well! Prices start at INR 1500, so don’t wait for the festive season to get your loot!